The Gaels who attended the University in the centuries following the Reformation (1560) can, broadly speaking, be placed into two categories, those from the clan nobility, na daoine uaisle, who were privileged and had money on the one hand and students who were supported by the church on the other. The main reason that promising youths were supported in their studies at University was that it was hoped they would return to the Gaidhealtachd and serve as clergymen in their native communities. The old pre-Reformation systems for educating clergy came under some strain due to the upheavals of the 1560s. Both University and church had to cope with new arrangements, and now educate trainee ministers rather than priests, but from the 1570s onwards student numbers revived. No names of students survive between 1560 and 1578 but from then on names from the Gaelic speaking areas of Argyll and the Isles can be seen in student lists, sometimes one or two names, sometimes several in each year group. Campbells proliferate amongst the Highland names in lists of students but one also meets MacLachlanns, Darrochs, Camerons, Buchanans, Colquloulns, MacCalmans, Maclean, Macleods, MacAllisters, MacQuarries, Galbraiths: all names associated with the Gaidhealtachd during this period. One of these students was Ninian Campbell from the Gaelic speaking area of Cowal, born in 1599. He came to Glasgow University in 1615, graduating in 1619. He then went to France and joined the University of Saumur where he was given the title ‘Professor of Eloquence’ by 1625. He composed poetry and his best known publication is his ‘Treatise upon death’ (1635). He returned to Scotland by 1630 and became the minister in Kilmacolm, a lowland, non-Gaelic parish, but his connections with Glasgow University continued. The title page of Ninian Campbell’s “Treatise upon death” (Edinburgh, 1635). This image is reproduced by kind permission of Special Collections, Glasgow University Library (shelfmark, Sp. Coll. Mu39-i.25). He donated 40 merks to a University building fund in 1632 and composed a Latin praise poem to the University, ‘Ad Academiam Glasguensis,’ around the same time. He was a friend of William Blair, a regent at the University and he also served as a member of a committee of visitation which examined the running of the University in 1639. He received a call from the parish of Rosneath in 1651 and one of the reasons they requested him was that he was ‘a native hielander [and he] was skillful in the Irisch language and that the paroch of Rosneth or a great part thereof did consist of inhabitants who only had the Irisch language.’ Gaelic speaking ministers were generally in great demand for Gaidhealtachd areas and it may be that Mr Ninian himself may have wished the opportunity to use his native language. Mr Ninian’s son, Cailean, followed his father to the University of Glasgow (1647-48) and also shared his father’s interest in Gaelic. Cailean took Gaelic lessons from Eoin or John ‘MacMarques’ in Kintyre (see below). Argyll is the most obvious Gaidhealtachd area in connection with the University of Glasgow in the early modern period (most of the students from the northern areas of the Gaidhealtachd went to Aberdeen at this time). Successive chiefs of Clan Campbell designated variously, Earl, Marquis or Duke of Argyll, wielded great power and influence not only locally, but on a national stage. Gilleasbuig Campbell, the fourth Earl of Argyll converted to the new Protestant faith possibly as early as 1536. He and almost all of his clansmen (as far as can be seen) and their successors embraced Protestantism with zeal and used their influence to spread and support the new creed particularly after the Church in Scotland broke with Rome in the Reformation of 1560. John Knox, one of the leaders of the Reformation delivered a sermon at Castle Campbell, one of the clan strongholds in 1566. Two Campbells received explicit support from the Privy Council, the government agency of the day, to help keep them at the University of Glasgow in the latter sixteenth century. Dùbhghall Campbell, the son of the Dòmhnall Campbell of Achavullin (Ach’ a’ Mhuilinn? ), was given a grant to help him in his studies in 1581. Another Dùbhghall Campbell, son of the laird of Ardkinglass, was a student at Glasgow of theologian and educational reformer, Andrew Melville, around the same time (c.1575-80). This Dùbhghall, who, as a wealthy laird’s son probably had no need to worry about financial support, went on to become the Dean of Brechin. An illustration of the type of support offered to Highland students from a less wealthy background at this time can be seen below. 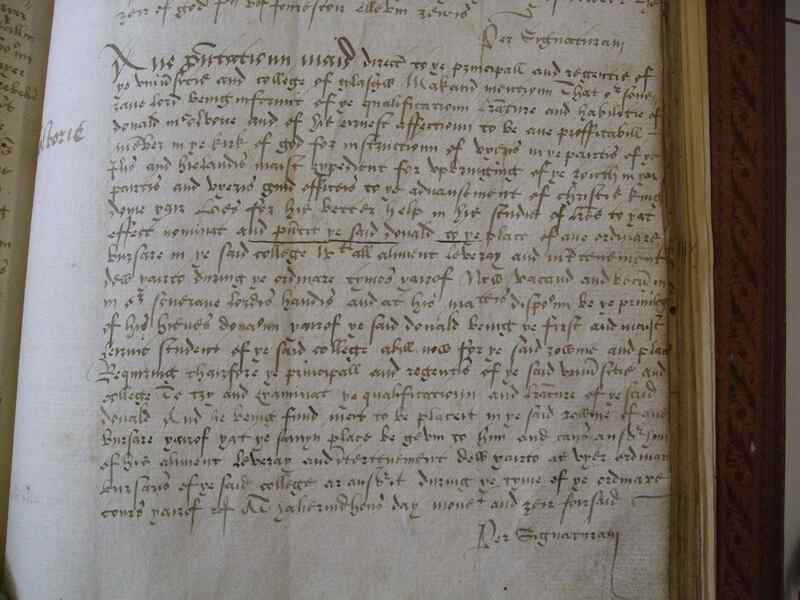 An entry in Privy Seal Register, Edinburgh, authorising a grant of money for the highland student, Dòmhnall (or Donald) ‘McOlvorie’ in order to support him in his studies at the University of Glasgow, 1591. This image is reproduced by by kind permission of the NRS, Crown Copyright, National Records of Scotland, PS1/62, folio 195. Ane P[re]sentatioun maid direct to the principall and regentis of the universiteis and college of Glasgow. Makand mention that our soverane lord being informed of the qualification, l[ite]rature and habilitie of Donald mcOlvorie and of his ernest affection to be ane profittabill me[m]ber in the kirk of God for instruction of utheris in the partis of the ilis and the hielandis maist expediant for upbringing of the youth in thai pairtis and utheris guid officeis to the advancement of Christes kingdome thair, hes for his better help in his studies of l[et]ters to that effect, nominat and p[rese]ntit the said Donald to the place of ane ordinair bursar in the said college wt all aliment leveray and int[er]teinment dew theirto during the ordinare tymes thairof. Now vacand and becu[m]in in o[u]r Soverane Lordis handis, and at his Ma[jes]ties disposition be the privilege of His Hienes dona[tio]n thairof, the said Donald being the first and maist lernid (?) student of the said College, abill now for the said rowme and place. Requiring thairfore the principall and regentis of the said Universitie and college to try and examinat the qualificatioun and l[ite]rature of the said Donald, and he, being fund [worthy], mo[n]eis to be placeit in the said rowme of ane bursare thairof that the samyn place be giving to him and caus anss[we]r him of his aliment, leveray and i[n]tertenement dew thairto as uther ordinar bursaris of the said college ar anss[we]rit during the tyme of the ordinare cours thairof etc., At Halieruidhous, day, monet[h] and yeir foirsaid [5 October 1591]. Letters such as this (above) were granted to Highland students but it is worth paying attention to why they said they were providing such support. Dòmhnall McOlvorie was given this grant in order that he would become a member of Christ’s Church who would play a role in teaching others in the Highlands and Islands, especially youths. In this case the Crown’s investment paid dividends. They got a minister who was fluent in Gaelic, Latin and Scots. After his graduation, 1594, McOlvorie want to Barony parish, Glasgow, before returning to the Gaidhealtachd shortly afterwards. He spent time in the Gaelic charges of Rothesay and then Inveraray, until his death around 1645, the location of his last parish, an indication of his closeness to the chiefs of Clan Campbell. McOlvorie was followed to the University of Glasgow by many other students from the Synod of Argyll although there were never enough students from the Synod’s point of view and many parishes struggled to fill vacancies. Another student who attended the University of Glasgow shortly before McOlvorie was to have a great influence on the Gaidhealtachd even though he did not (as far as we know) speak Gaelic. This was Andrew Knox (MA 1587) from Renfrewshire. He became a minister and was appointed Bishop of the Isles by King James VI in 1606. The King, who was attempting to impose control of the Hebrides, chose Bishop Knox to lead Crown policy with regards to Clan chiefs in the Isles. Knox famously kidnapped a number of Hebridean chiefs and transported them to Edinburgh. These chiefs were then obliged to support a series of measures identified by the Privy Council and by Knox as fundamental to the reform of the Highlands, known as the Statutes of Iona. Despite this growth in pressure from the Lowlands, Highlanders were not deterred from attending the University of Glasgow and, if anything, the number of Gaels attending the University increased not only in terms of the clan hierarchies (See ‘clanship in the 17th C’ on the previous page) but also in terms of the number of students supported by the church. Grants such as those granted to Dòmhnall McOlvorie, as seen above were a burden on the Privy Council who sought to pass these costs on to parishes. Irrespective of who funded this, it was clear to contemporaries that a supply of Gaelic speaking ministers needed to be trained to serve the Gaidhealtachd. Between a quarter and one third of all Scots spoke Gaelic in the mid seventeenth century and a large section of these people had no English whatsoever. Most Gaels (somewhere between two-thirds and three quarters) were Protestants: a creed in which access to the Word of God and the ability to read it were fundamentals of the faith. This caused great problems for Gaelic Protestantism which lacked the basic instrument of instruction, the Bible in the vernacular, for over two centuries. The New Testament did not get published in Scottish Gaelic until 1767 with the Old Testament not appearing until 1801. For over 200 years preachers and catechists and a thin selection of readers in the Gaidhealtachd were faced with the task of extempore translation, as their flock were unable to access the Word of God for themselves. The Synod of Argyll was one of the most proactive church organisations in the Gaidhealtachd in attempting to address this need. 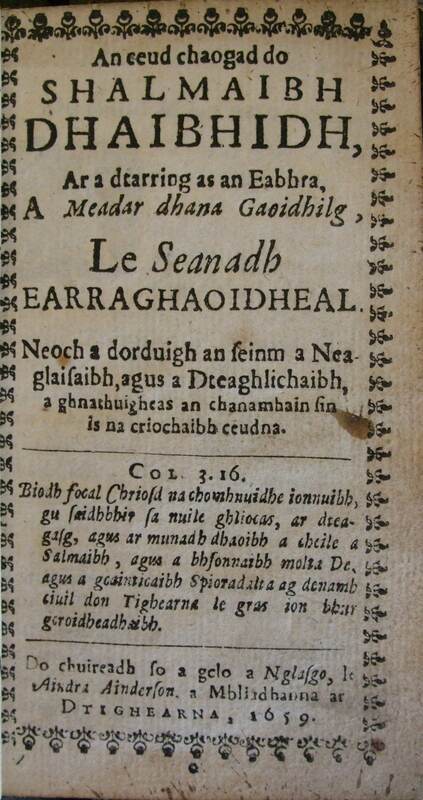 The Synod published the Shorter Catechism in Gaelic, 1631 and revised this following the Westminster Confession of Faith (1647) publishing this text in Gaelic under the title Foirceadul Aithghearr Cheasnuighe in 1653 and 1659. 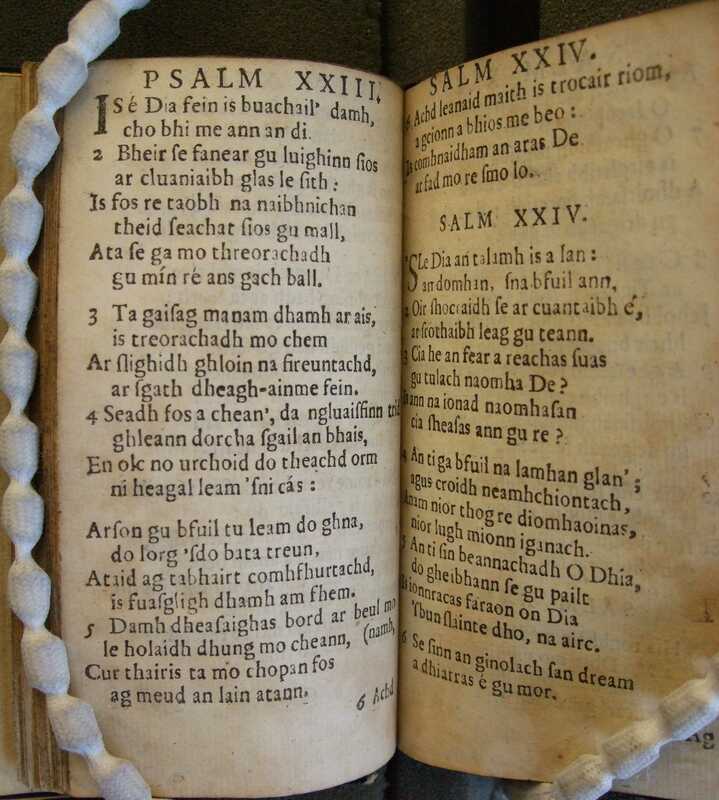 They also managed to get the first 50 psalms, An Cheud Chaogad, translated into Gaelic and published by 1659. The title pages of ‘An Cheud Chaogad’ (below, left) and ‘Foirceadul Aithghearr Cheasnuighe’ (above, right) both published by the Synod of Argyll, 1659. These images are reproduced by kind permission of Special Collections, Glasgow University Library (shelfmarks, Be6-e.24 & TCL 582). This edition of the catechism (Foirceadul) was published, probably, by 1653 (rather than 1651), although no copies of the first edition survive. There is a reference in the Minutes of the Synod of Argyll, 1653, that each minister within their bounds was given a copy. It must have been a small print run and the Synod determined in 1655 that they would have to publish a further 2000 although it was to be 1659 before the second edition of this catechism was finally published. Having taken the catechism, Foirceadul Aithghearr Cheasnuighe, in hand and published it, perhaps, in 1653, the Synod then turned their energies to translating the first 50 psalms. 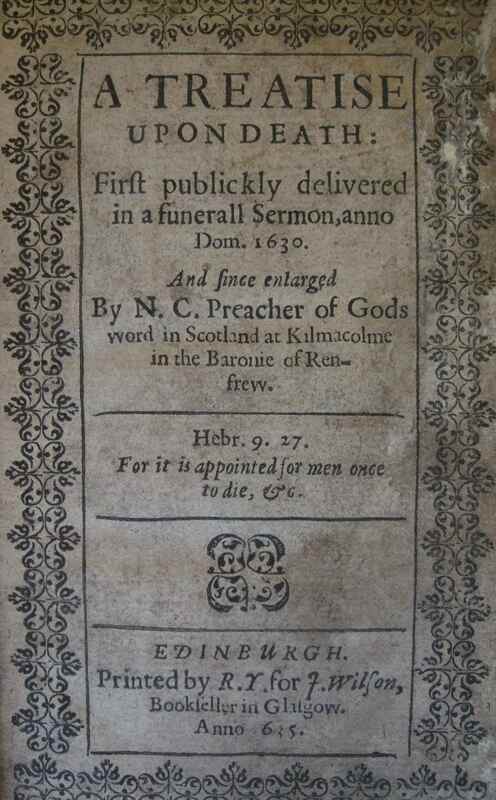 Mr Eòghann Cameron (MA, Glasgow, 1616) minister of Dunoon, of was apportioned the first twenty psalms, Mr Dùbhghall Campbell (MA, Glasgow, 1619), minister of Knapdale, was given psalms 21-40 and the final ten, psalms 41-50, were given to Mr Alasdair Maclean the minister of Strachur. The translation of these psalms from Hebrew must have been an onerous task on top of their normal clerical duties. The Synod’s plans did not stop with the planned first 50 psalms and a Màrtainn MacLachlainn and Mr Iain Stewart (MA, Glasgow 1642) were each given another ten psalms to translate. This work must also have included checking and comparing each others’ translations. The translators were given strict guidelines in order that their final texts be suitable for singing and that they had to have: ‘eight syllabes the one line and six the other, that they may answer and be sung with the common tunes that are for the Engliss, and they ar to be brought to the nixt synod that they may be revised and corrected and made fitt for the press.’ This was still underway at the next meeting of the Synod in May 1656, but the work had been completed by the meeting of May 1658. At this meeting the Synod were very happy with the texts although dissatisfied with the metre and rhythm of some of the translated psalms declaring them to be ‘defective in syllibicatione.’ In order to ameliorate this two of the translators were ordered to take the texts to Campbelltown to seek the advice and help of ‘Jon McMarques in Kintyr, ane old man and able in the Irish language…’ This seems to have been accomplished fairly quickly and 1500 copies of the first 50 psalms, An Ceud Chaogad do Shalmaibh Dhaibhidh, ar a dtarraing as an Eabhra a meadar dhana Gaoidhilg, were published by ‘Aindra Ainderson’ in Glasgow, May 1659. Psalm 23, below, as it appears in ‘An Cheud Chaogad’ (1659). Possibly translated into Gaelic by Mr Dùbhghall Campbell (MA, Glasgow, 1617), the minister of Knapdale. This image reproduced by permission of Special Collections, University of Glasgow Library. All of this clerical activity aimed at translating and publishing Gaelic religious texts had the tacit support of Gilleasbuig (or Archibald) Campbell, Marquis of Argyll (c.1607-1661), one of the pre-eminent leaders of the Scottish Covenanting Revolution, with great influence throughout the Gaidhealtachd and far beyond. Gilleasbuig, moreover, was a man with deep religious convictions. This support of Gilleasbuig, as chief of Clan Campbell, for the publication programme is hinted at in a grant he gave to Mr Eòghann Cameron, the minister of Dunoon in 1642. Mr Eòghann was suffering from ill health at this time and worried about provision for his son’s education. The Marquis gave Mr Eòghann a grant of lands in Dunoon to support his living as a minister to the Gaelic and the English congregations in the town. The Marquis also pledged that he would support Mr Eoghann’s son’s education should this prove necessary. Mr Eòghann, despite his period of ill health, recovered and continued in post long after this, and his son, Iain Cameron graduated from Glasgow University in 1647 and followed in his father’s footsteps as a minister and scholar of Gaelic. Young Mr Iain took the Gaelic charge of Campbelltown and was one of the ministers selected to translate the Book of Ruth in 1660 (see below) and was later identified by the Privy Council in 1674 as a potential translator of additional psalms at a time when a less ambitious programme of further translation was being mooted. It is clear from the Minutes of the Synod of Argyll that their ambitions during the period of the Covenanting Marquis with relation to Gaelic religious publication went far beyond the modest output of a catechism and the first fifty psalms of 1659. A minute of a meeting of the Synod, 2 November, 1660, shows that they probably intended to translate the entire Old Testament. Mr Gilleasbuig MacCalman (MA, Glasgow, 1636), minister of Muckairn, had already, it was noted, translated Job, Proverbs, Ecclesiastes and Song of Solomon. A list was drawn up apportioning the task of translating some of the remaining books of the Old Testament to various members of the clergy throughout the Synod. Ruth Mr Iain Cameron Kilfinnan MA, Glasgow, 1647. 1 Samuel Mr Raibeart Duncanson Campbelltown MA, Glasgow, 1655. 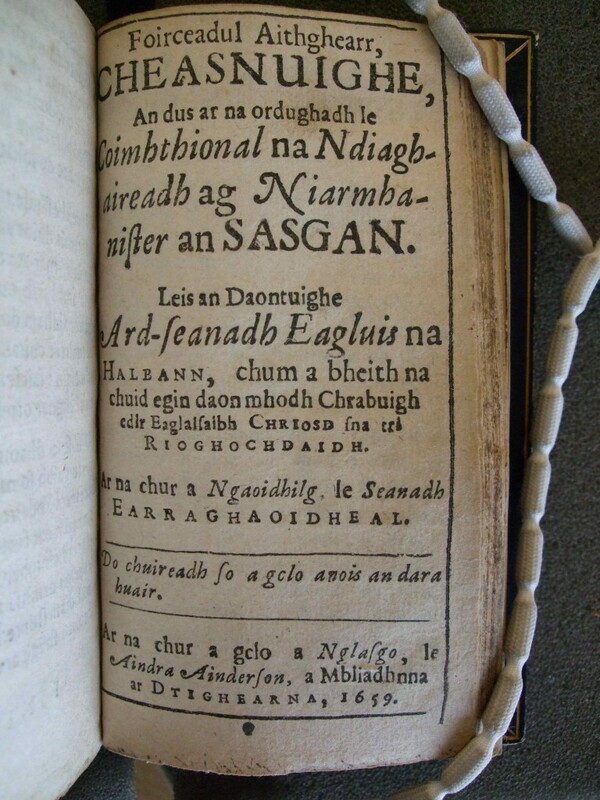 2 Chronicles Mr Gilleasbuig MacCallum Glasaraidh 1639-92 MA, Glasgow, 1627. Ezra Mr Eachann Maclean Morvern MA, Glasgow, 1628. Song of Solomon Mr Iain Stewart Rothesay MA, Glasgow, 1642. It can be seen from the right hand column of the table listing these ministers, their parishes and their universities that the overwhelming majority of these ministers were Glasgow graduates (80%). The ambitious programme of translation on which they embarked was not completed despite their earlier successes with the Catechism (‘Foirceadul’) and the first fifty psalms (‘An Cheud Chaogad’). Why? It is not immediately apparent why this initiative did not continue but the timing of it might suggest that it was connected to the fortunes of their political patron. 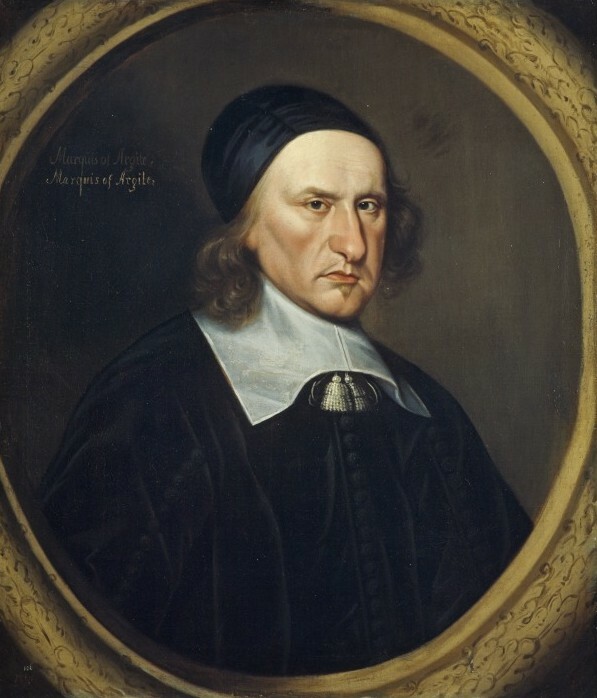 The Marquis of Argyll, a staunch Presbyterian, had been one of the leading lights in the Covenanting (and Presbyterian) regime that had overthrown Charles I. The Marquis was executed, in turn, by a vengeful Charles II in 1661. Hard times befell not only the Campbell chief but also the Presbyterian church and clergy of whom he had been such a zealous supporter. The new Restoration regime (1660-89), favouring Episcopalianism, showed little enthusiasm for either Presbyterian clergy or, presumably, for their agenda of translation and publication. This took the wind out of the sails of the Presbyterian publication agenda for Gaelic. This impetus was not regained for well over a century when the New Testament was finally translated and published in 1767 followed, eventually, by the complete Old Testament in 1801. A lack of Gaelic religious materials were only one of many problems facing a hard pressed church. It was imperative, given the inability of most of Gaelic Scotland to access the scriptures, that a Gaelophone clergy would try their best to fill that gap and instruct their flock, providing, presumably, extempore translations of the English Bible. Yet the Church struggled to fill parishes with Gaelic speaking ministers. The Church of Scotland, however, recognised the pressing need for a Gaelic ministry and sought to address the supply of parishes by supporting Gaelic speaking students through education at schools and Universities in the expectation that they would return to the Gaidhealtachd and fill clerical vacancies. Such students were supported by monies levied at both local synod and national level. It was expected (or seemingly taken for granted) that students would be capable of operating at Gaelic before they embarked on a course of study of divinity or arts at a lowland university – and no university anywhere in Scotland offered Gaelic prior to 1882. There was, by the end of the seventeenth century, a thin network of schools in Argyll and Isles from Campbelltown to Stornoway under the direction of the Synod of Argyll but here the emphasis was overwhelmingly on the learning of English and Latin and not at all (as far as is known) on Gaelic. The extent of this network, long predating the later SSPCK (Scottish Society for the Propagation of Christian Knowledge, 1709-) continues to be overlooked despite being highlighted in a study by the Rev. Donald Mackinnon as long ago as 1938. Mackinnon mapped the progress of the Synod’s educational efforts during the course of the seventeenth century and drew up a table showing that no less than 25 schools were established in various locales between Kintyre and Lewis by 1698, with a further 14 ambulatory schools and an additional 5 grammar schools. Such an educational initiative did wonders for those lucky enough to benefit from it but it did little for the majority of people who received no education and remained reliant on English literate ministers and readers to allow them access the message conveyed in English language scriptural materials – which was the prime motivation for this schooling. Gaelic-language ministers necessarily operated (and operate) using complex registers of language. Gaelic, however, was not on the curriculum and a sound knowledge of Latin, Greek, English and divinity was simply not enough to equip Highland ministers for their parish duties with Gaelophone congregations. Gaelic speaking students were, in this manner, placed at a considerable disadvantage, having no formal instruction in their native tongue in schools far less University and no scriptural materials with which to work. Yet the expectation was that they would preach in Gaelic. The Synod and its leaders, comprised largely of serving ministers, were all too familiar of the scale of the problems they faced. They were careful to ensure that those they placed in charges were capable of preaching in Gaelic. There are hints in the Minutes of the Synod of Argyll that youths (in Argyll at least) received some additional or informal tuition in the reading and writing of Gaelic (over and above their formal English and Latin education) prior to their departure for University. Aonghas MacMartin, a student from Lorn, was brought before the Synod in 1659 with a view to securing funding for his education. The Synod were reluctant to grant him any further monetary support until they saw ‘what his progresse in Irish [i.e. Gaelic] and other learning may be.’ The Synod collector disbursed 80 merks in 1659 to Cailean Campbell, son of Mr Ninian Campbell (discussed above), to pay Cailean’s expenses while he was ‘with McMarquesse in Kintyre studeiing the Irish language’. Cailean had been in the fourth class at the University of Glasgow, over ten years earlier, 1647-48 although it is not clear what he did in the intervening period. This ‘McMarquesse,’ moreover, with whom Cailean was studying at Campbelltown, ‘Jon McMarques in Kintyr, ane old man and able in the Irish language…’ seems to have been the Gaelic language expert consulted by the Synod. not only for teaching but for questions related to Gaelic texts. ‘McMarques’ or MacMharcuis gave advice, as noted above, to the ministers who were working on translating the first fifty psalms, Mr Dùghall Campbell (MA Glasgow, 1617), Mr Iain Stewart (MA Glasgow, 1642), Mr Dùbhghall Darroch (MA Glasgow, 1638) and Mr David Simson (MA St Andrews, 1650). This Jon or Eoin MacMharcais was probably a member of a family of traditional Gaelic poets that had been established in Kintyre for centuries. The counsel he provided for these ministers who were moving towards a more vernacular style of writing, provides a direct example of one of the important links between the old traditional Gaelic world and the emerging modern vernacular written Gaelic. Such was the demand for ministers and the difficulty in finding Gaels to staff vacant parishes that ministers from outwith the Gaidhealtachd came in and learned Gaelic. Two St Andrews graduates ‘David Simsone’ and ‘Mr Johne Lindsay’ came into the Synod with the intention of acquiring the language and preaching in it. It is not clear how they managed to learn the language, but pick it up they certainly did (although it must have helped that Gaelic was spoken as the everyday language all around them). The Synod took care to ensure that the new Gaels were up to standard by giving them an ‘trial’ or examination in 1659 on their ability to preach in Gaelic before a panel of three ministers: Mr Eòghann Cameron minister of Dunoon (MA, Glasgow, 1616), Mr Alasdair Maclean the minister of Strachur and Mr Gilleasbuig Reid the minister of Lismore (MA, Glasgow, 1629). Both Simsone and Lindsay passed this test and went on to have successful careers as Gaelic speaking ministers within the bounds of the Synod. The struggles of these Protestant ministers was not helped by the status of Gaelic both within and outwith the Gaidhealtachd. Gaels themselves had long used Latin and, increasingly, Scots, as their language of written communication, a pattern reinforced, no doubt by national patterns of education which favoured Latin and Scots (and English post 1603). What most Gaels themselves thought about this is not clear, but they seemed to go along with it, with the most influential members of Gaelic society being overtly pressurised in 1609 to school their heirs in a Lowland, non-Gaidhealtachd environment. Official, Lowland, antipathy towards Gaelic was more often latent rather than proactive but the long term view taken by the Scottish authorities was best expressed by an Act of the Privy Council, 10 December 1616, indicating their wish that ‘the vulgar Inglishe tongue’ be ‘universallie plantit’ in the Highlands in order that ‘Irishe language’ (Gaelic) be ‘abolisheit and removeit’. This is the clearest and most well known expression of official antipathy to the language – an approach, arguably, that lasted until the end of the twentieth century. So universal was Gaelic speech and so few were the opportunities for education in the seventeenth century Highlands, however, that the government simply could not wish the language away. The Church and even the government reluctantly, by increments, inched towards formalising the use of Gaelic as a medium of religious instruction. An Act of Parliament, 1641, stated that the stipends from each vacant parish should be put to one side and kept to support students at colleges and universities. The University of Glasgow was quick to take measures to implement this and, in 1641, set aside four out of the six bursary places they had in the Divinity Faculty for the training of Highland students. This was a great help in supporting students from the Highlands and especially in Argyll, the Gaidhealtachd area most closely associated with Glasgow. The Privy Council made another list of 22 ‘poor Highland’ scholars from Argyll who needed maintaining at schools and colleges. One of those was William Fisher from Dunoon. Fisher finished his fourth year at the University of Glasgow, 1663, graduating MA. He was inaugurated as minister of Dunoon in 1669. The Bishop of Argyll drew up a contract with Fisher at this time which gives us an insight into the duties he was expected to perform as minister. He was to preach for two successive weeks at Dunoon and to preach in Kilmun every third week. Fisher was also obliged to preach in Gaelic and in English and to perform the usual duties expected of a minister, such as baptisms, catechising and marriages. The Bishop of the Isles (1663-74), Robert Wallace (MA, Glasgow, 1631), was a native of Kilmarnock and had no Gaelic but he too, like his colleague in Argyll, was mindful of his responsibility to his diocese. He set up, with parliamentary approval, a scheme, September 1663, to use the vacant stipends in the Isles to support six expectants (at parish schools) and six students (at University) ‘ who have the Yrish toung.’ Many of the students supported in this manner, particularly from the southern Hebrides, will have been educated in Glasgow. Funding was a perennial problem for students, something, unfortunately, that is still with us. In order to combat this issue, the Synod of Argyll, as mentioned, above, appropriated the stipends of vacant parishes for the se of supporting students at college. Many of the quitclaims or receipts given by students to the synod when they received monies, survive from between the seventeenth and the nineteenth centuries. Two such documents can be seen below (no. 1 & 4). Often the Synod of Argyll was late in paying student funding and sometimes they simply did not have enough funds to pay the students they intended to support. 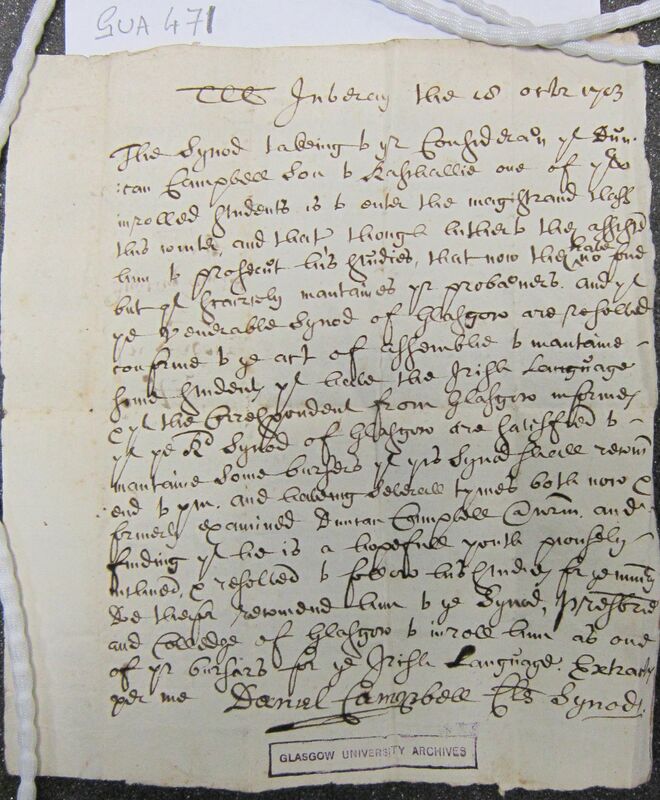 Item 3, below, is an example of this, where the Synod of Argyll wrote to the neighbouring Synod of Glasgow and to the University of Glasgow in 1703, asking them to try and find money to enable a student, Donnchadh Campbell, to complete his studies (no. 3, below). Images and transcripts of such documents follow, below, together with a letter of recommendation from a University of Glasgow professor to the Presbytery of Skye, in favour of his students from 1710 (item 2, below). Letter authorising a monetary grant to Dùbhghall Bannatyne, student, 1696-7. ICA, bundle 57. This letter reproduced by kind permission of his Grace, the Duke of Argll, Inveraray Castle. A Dugaldus Ballantyne appears on the roll of Glasgow University in February 1692 and is probably the individual found in this acquittance even though this document was endorsed by Bannatyne in Edinburgh. He became minister of the Gaelic speaking parish of Kilmorie in Arran in 1701 and remained in post until his death in 1748. A letter of recommendation/ reference by a Glasgow University Professor in support of two former students. For a short account of Professor Simson on the University of Glasgow story click here. An image and then a transcript of this testimonial from Professor Simson, 1710, on behalf of Macleod and Beaton, follows, below. Letter from the Synod of Argyll to the Synod and University of Glasgow, 1703. 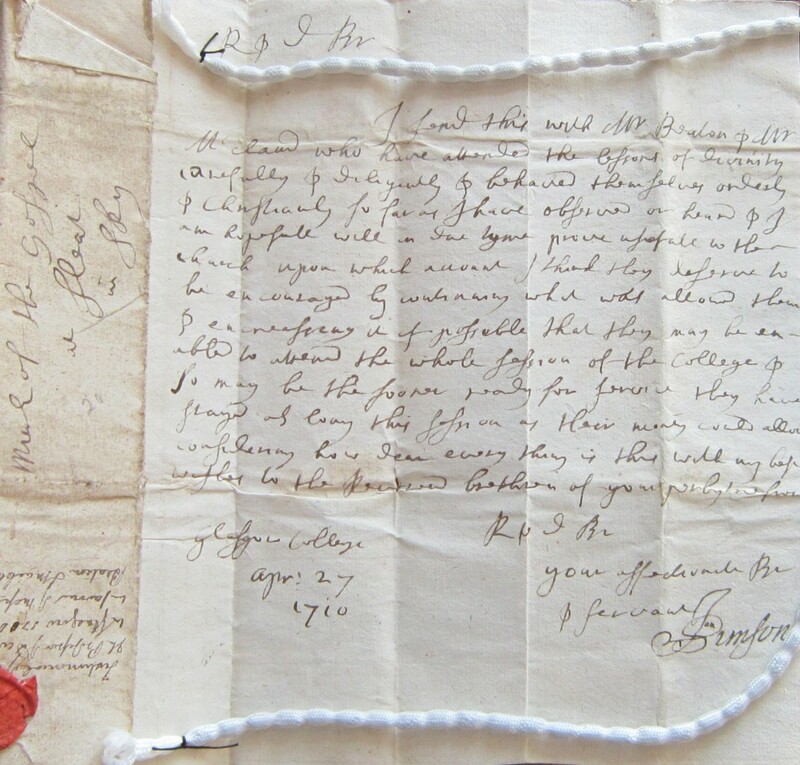 Four letters from the Presbyteries of Kintyre and Inveraray addressed to the Synod and College of Glasgow, 1703-1711, survive in the University archives. They are written requesting that these Gaelic speaking students be supported by the Glasgow institutions as the Synod of Argyll themselves had insufficient funds to pay for all the students on their books. An image and a transcript of one of these letters follows, below. This was written on behalf of a Gaelic speaking student, Donnchadh (Duncan) Campbell from Ros-choille (Raslie), in the Kilmartin area, 1703. This picture is reproduced by kind permission of the University of Glagow. (©University of Glasgow Archive Services), GB0248, GUA, 471. 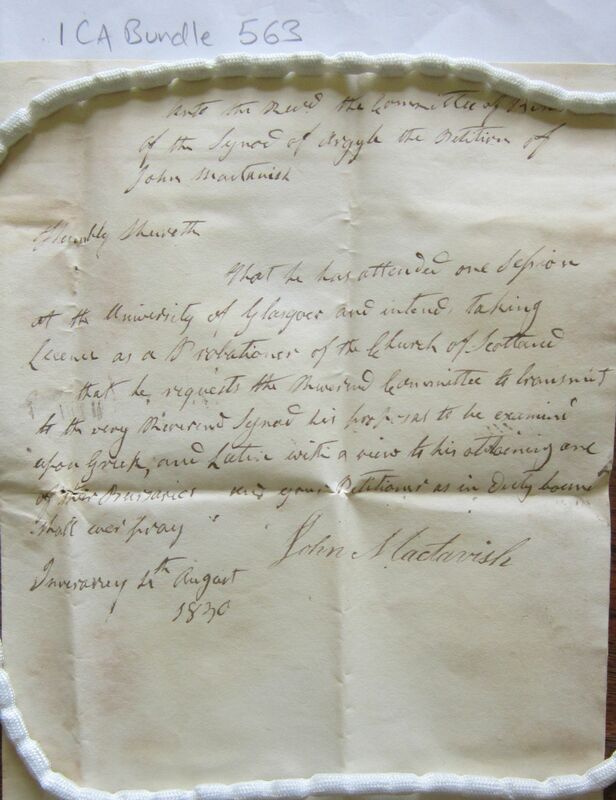 Letter from the Synod of Argyll to the University on behalf of Iain MacTavish, 1830. An image of the letter, transcript and brief commentary follow below. Iain Mactavish was born in the Isle of Jura, 1816. He was the son of Mr Gilleasbuig Mactavish, minister in various parts of Argyll. Iain Mactavish was one of the founder members of An Comann Oiseanach, 1831-32 while he attended the University of Glasgow and he regularly attended meetings of An Comunn until up around 1835. A Mr Iain MacTavish, presumably the same man, was a secretary of An Comann Oiseanach, 1837-39. He joined the Free Church of Scotland following the Disruption of 1843. He was the minister of the Free Church congregation at Ballachulish, 1844-52. He resigned in 1852 and accompanied 300 of his flock on an emigrant ship bound for Austrailia. He was forced, however, to leave the ship at Cork due to an outbreak of smallpox. He subsequently spent time in Canada in various parishes as a minister and he served for a time as a Moderator of the Canadian Synod. He returned to Scotland in 1876, becoming minister in Inverness where he remained until his death in 1897. A.L. Brown & M. Moss, The University of Glasgow: 1451-1996 (Edinburgh University Press, 1996), 7-9. D. Murray, ‘Ninian Campbell, Professor of Eloquence at Saumur, minister of Kilmacolm and of Rosneath, Scottish Historical Review, 18 (1921), 183-198. N. Campbell, A Treatise upon death. First publickly delivered in a funerall sermon, anno do. 1630, and since enlarged by N.C., preacher of God’s Word in Scotland at Kilmacolme in the Baronie of Renfrew (Edinburgh, 1635). J.E.A. Dawson, The Politics of Religion in the Age of Mary Queen of Scots. The Earl of Argyll and the Struggle for Britain and Ireland (Cambridge, 2002), 17 (& note 21), 24. All of the Campbell chiefs from the 4th Earl onwards through into the eighteenth century and beyond were staunch Protestants with the sole exception of Gilleasbuig ‘Gruamach,’ the 7th Earl of Argyll. Gilleasbuig started out as a zealous Calvinist but converted to Catholicism in 1618, causing a crisis in his clan. Gilleasbuig was obliged to leave Scotland and relinquish leadership of his clan as a result of his conversion. A. I. Macinnes, The British Confederate. Archibald Campbell, Marquis of Argyll, c. 1607-1661 (Edinburgh, 2011), 52-3, 63. J. Durkan & J. Kirk, The University of Glasgow, 1451-1577 (Glasgow, 1977),359, 375. R. Black, ‘A provisional handlist of printed Gaelic books, 1567-1800,’ in, Scottish Gaelic Studies, 25 (2009), 35-94, at 43-45. D.S. Thomson, the Companion to Gaelic Scotland (Glasgow, Gairm, 1994),23-24, 109. For a survey of the patterns of Scottish Gaelic religious allegiance, clan by clan, during the Jacobite wars see, A.I. Macinnes, Clanship, Commerce and the House of Stuart, 1603-1788 (East Linton, 1996), 247-249. MacTavish, Minutes of the Synod of Argyll, vol. i, 173, 185, 222-3, vol. ii, 3, 15, 35, 98, 145-6, 177, 199, 200. Mr Eòghann Cameron translated, presumably, ‘A brief sum of human doctrine.’ If this was published all copies were lost. He also translated part of the Shorter Catechism around this time. Cameron was also responsible for seeing the catechism (Foirceadul) through the press in 1652. Cameron drew up a contract, earlier, 27 October 1642, at Inveraray with the Marquis of Argyll where the Marquis promised to support Cameron’s son, seeing he was ‘at the schools and is of good expectation to be a scholar and may be profitable in the Highlands if he be kept at school, should Mr Ewine die before expiry of the said period… ….the superplus of the stipend at Dunoon and Kilmund is to help in the training of the said boy in school…’ H. Scott, Fasti Ecclesiae Scoticanae (8 vols, Edinburgh, 1915-50) [FES], iv, 23, 49. Inveraray Castle Archive [ICA], Argyll Transcripts [AT], xii, 162. MacTavish, The Minutes of the Synod of Argyll, vol. i, 160. 173, 222-3. vol., ii, 35, 15. Register of the Privy Council of Scotland (3rd Ser. ), [RPCS], vol. viii, 414. MacTavish, ed., The Minutes of the Synod of Argyll, 1639-1661, vol, i, 185, 273, 187, 193, 222-3. vol., ii, 2, 3, 15, 35, 98, 105, 145-6, 163, 177, 185, 199, 203, 211, 224. MacTavish, ed., The Minutes of the Synod of Argyll, 1639-1661, ii, 224. Am fiosrachadh mu choitheanalan agus foghlam gach ministear: FES, iv, 5-6, 9, 13, 16, 27, 28-29, 30-31, 34, 44, 49, 60, 66, 100, 114. FES, vii, 333-4. MAUG, iii, 72, 99, 103, 106. Further information on these ministers, their parishes and the sources of information can be found on a PDF file, click on this link:The Synod of Argyll and the OT_1660. R. Black, ‘Gaelic religious publishing, 1567–1800′ Scottish Gaelic Studies, 24 (2008), 73-86. David Stevenson, ‘Campbell, Archibald, ninth earl of Argyll (1629–1685)’, Oxford Dictionary of National Biography, Oxford University Press, 2004; online edn, Oct 2005 [http://www.oxforddnb.com/view/article/4473, accessed 19 Aug 2014]. A.I. Macinnes, The British Confederate. Archibald Campbell, Marquess of Argyll, 1607-1661 (Edinburgh, 2011), 291-3, 302-303. F. A. Macdonald, Missions to the Gaels. Reformation and Counter Reformation in Ulster and the Highlands and Islands of Scotland, 1560-1760 (Edinburgh, 2006), 101, 120, 122, 127-8. C. Ó Baoill, ‘Domhnall Mac Mharcuis,’ Scottish Gaelic Studies, 12 (1976), 183-193, at 184-5. MAUG, iii, xiv. MacTavish, ed., The Minutes of the Synod of Argyll, ii, 204, 212. Murray, ‘Ninian Campbell, Professor of Eloquence at Saumur,’ 197. The parish school system within the bounds of the Synod of Argyll expanded greatly during the later seventeenth century. 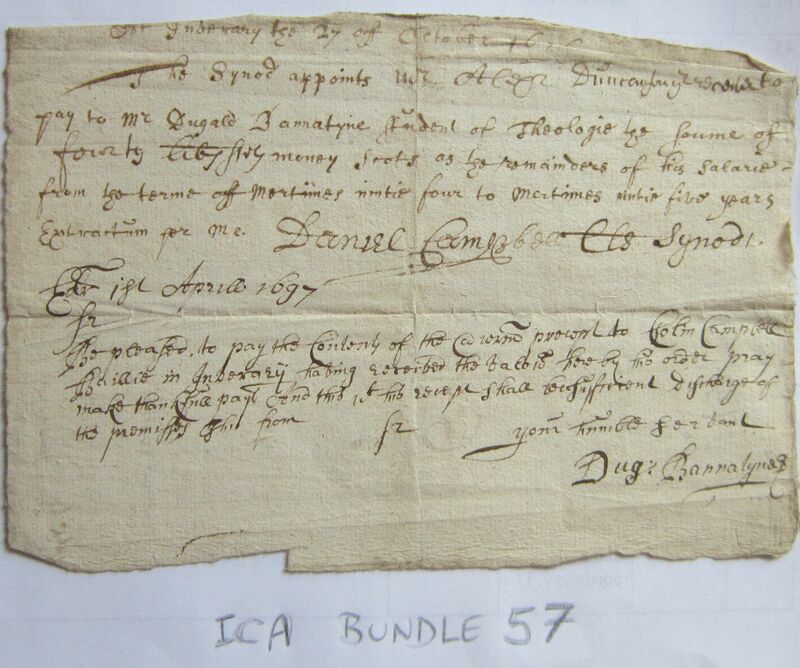 ICA, Bundle 539. FES, iii, 362. RPCS (3rd ser. ), i, 21-22. The minutes of the Synod of Argyll has numerous references to students. MacTavish, ed., The Minutes of the Synod of Argyll, 1639-1661(2 vols., Edinburgh, 1943-44). The letter under consideration here has a reference number of ‘GUA 471.’ The other three letters addressed to the University from the Presbyteries of Inveraray and Kintyre on the same theme are items GUA 459, GUA 469, GUA 470. For Campbell of Raslie / Ros-choille, see FES, iv, 14, 92; MAUG, iii, 174-5. G.H. Johnston, The Heraldry of the Campbells, volume 2 (Edinburgh, 1921), 40-41. J.R.N. Macphail, ed., Highland Papers, iv (Edinburgh, 1934), 75. FES, iv, 76. W.I. Addison, The Matriculation Rolls of the University of Glasgow from 1728 to 1858 (Glasgow, 1913), no.12546. Glasgow University Library, Special Collections, MS Gen 1363/4, 85, 118-130.